Here is a painting of one of my dogs, my beautiful Lab, Maya. We can and do make things true in our minds all the time, and do so repeatedly in an almost steady stream, we even make lies true…whether we see it or not. But there is a Universal Truth…underlying it all. It is way beyond any little mind and all its dramas, emotions, and “I”stories… stuff that i have identified with, that parades through my mind. False me. I shudder….as more and more i See this. The collection of inner rubbish that keeps fundamental Truth from being experienced. So on that early morning, i asked the Angels to show me something true. And almost immediately i looked into my dogs sparkling eyes….and i experienced a glimmer of that Truth. I did! A true heart reaching out in that very alive moment with love and trust. Simple, pure and uncontaminated. No mind. Abiding, unconditional love, incapable of guile or betrayal, or even a bad mood! She touched that part of me. And so i painted her. that is true what you were saying on the blog…. Thanks for that!….. Thank you for your comment, Isaias….welcome to my blog!!! You too are a lovely person, and your friendship is a treasure to me. 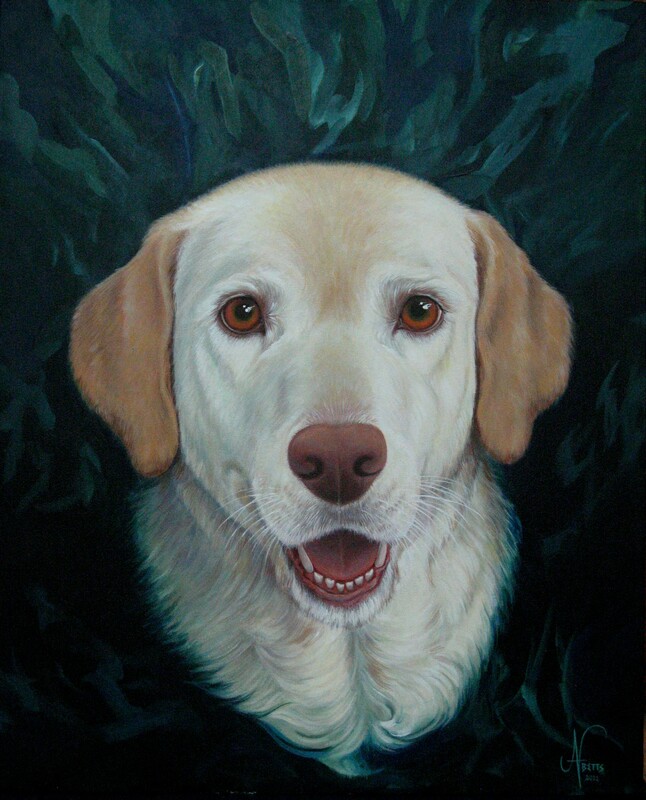 Ahh Jan I too see that “Truth in your dog’s eyes”, and what a beautiful painting of her too. Every hair and whisker so perfectly and lovingly placed. You honor her sweet unconditional love. She is a bright mirror that shows you how adored you are, every time you peer into those sparkling brown eyes. I think that is our Creator’s message too, although sometimes we find that Truth hard to believe. This painting shows your love and your technique, as well as your wisdom to see this subtle message, engraved in the face of your faithful dog, Maya. Her soul too can be glimpsed through her bright, trusting eyes. I just adore this portrait. Thank you for sharing it Jan, and your comment and thoughts leading up to painting it. What a gift to have such a constant support and encouragement as you always generously give, Karima. We share a bond of mutual admiration/appreciation, both for our art/poetry…as well as an abiding friendship based in a love that has proven to be unconditional. Finding the spark of the illusive spiritual crown, “unconditional love” in the eyes of “just a dog” may be difficult, even annoying, for some to understand or even respect…after all there are great human souls, those with whom we build a bond, and who we admire and who have been the wise ones, teachers, brilliant achievers, friends and family, who we have followed and been inspired by, learned from. Who we have loved and loved us. But there is something in the ever present simplicity of a dogs trust, loyalty and devotion…no questions asked, no opinions, the dog could care less if we are old, young, fat, skinny, beautiful or homely, successful or failure…etc….or even if we treat them well…..there is a constant there>> that is in itself a teacher. Every moment is a new one. That which can not be simpler. Interesting that her name is “Maya”.